Do you like Bacon? But hate the mess from pan frying it? I do! I also hate how long it takes to make it. You can only cook a few pieces at a time and then when your done, your cook everything else. Now your eating cold Bacon. I have a better idea. And we love it! !! Bake your Bacon !! 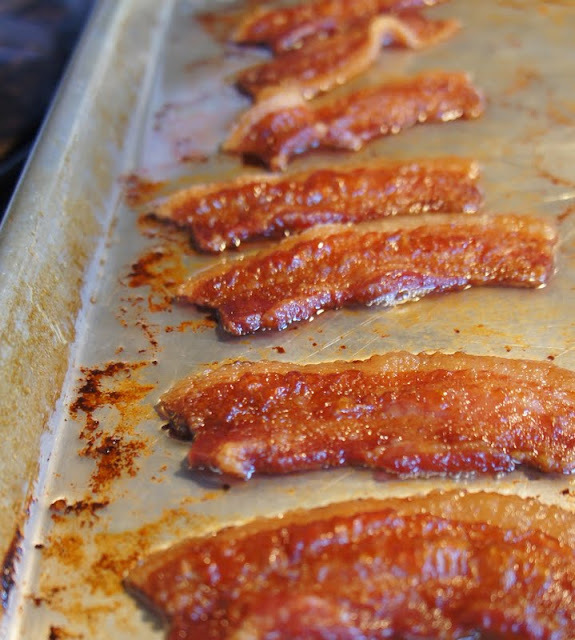 Spray Pam on a baking sheet..
Cut your bacon in half and place directly on your baking sheet. Cook in oven until desired crispness is met. We like ours crunchy. This is how they look when we pull them out! Mmmmm!!! Now your bacon can cook while you're getting all the other breakfast foods ready. And forget the greasy mess too!. TIP...we don't use a cooking rack because the bacon cooks better in its own grease. Plus it always seems to stick to the rack and when you take it off it breaks apart. Before serving, let the bacon sit on some paper towels. They will remove the excess grease that you don't want to be eating. I am making this for our Christmas morning breakfast!